"I have created a serious issue. I said what I should not have said." 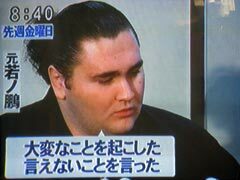 A sports reporter explains the quarrel between a weekly magazine and the ex sumo-wrestler and the latter's changing story. This is the related article of a weekly. The news casters insert their thoughts and impressions. And commentators add their opinions about this scandal. Concerning a murder case a female writer - second from left - comments on the mentality of the murderer. There are also wide shows specialized in the information related to the daily life. Here, the casters are tasting the food in focus. Young female announcers are treated like TV personalities - here left. They are talking about a female sumou tournament. When we experience foreign countries through visits or a long term stay, we tend to compare them with our home country. When I returned home from my first stay in Europe, I was painfully disturbed by the messy Japanese cityscape, in particular its ugly telegram poles and spaghetti-like electrical wires hanging in the air as well as small, cheaply built and mutually uncoordinated houses. A few decades have passed since then and the Japanese cityscape does not disturb me any more. The most disturbing factor of Japan is for me now its lack of a proper political decision-making process. Decisions are always made without a transparent process. We cannot clearly follow discussions and debates on pros and cons about the issues to be decided. What we can see through the media is only an emotional exchange of words between parties and not the professional arguments on the substance of the future decisions. It is also unfortunately our tradition that really important decisions are made without our knowledge. Maybe political parties themselves are not clearly aware of their importance or not able to understand them, as the recent decisions on the introduction of an insurance system for high senior people (Kouki koureisha) and the establishment of the lay judge (Saiban-in) system show us. It looks really silly that only bureaucrats of relevant ministries or departments are criticized or invited to explain to the media on these matters, though the relevant laws were approved by the parliament in its two houses. The really responsible persons are the politicians and media who have overlooked the problems. I have not seen any case where responsible politicians, either from the government or the opposition parties, explained these matters to the public. I have not heard any apology from the media about their idleness in picking up these matters before they were approved by the parliament. Now both politicians and media are not criticized but criticize other people. I mean they criticize bureaucrats, as if bureaucrats have the supreme power and are therefore solely responsible for making and executing important policies and they themselves are a sort of powerless opposition who was compelled to accept the policies they did not want. It is ridiculous and deplorable, since Japan is a democratic country steered by the representatives elected from among the nation. Or isn't it? I believe that this absence of discussion in Japan is to large extent due to the inability of media to extract the essentials of each issue under discussion and communicate clearly to the general public so that they can form their own opinion and make their own judgement. What we can see in the media report is mostly trivial details on political rivalries between parties or politicians. Even debates in the parliament or speeches in the street are reported not because of the importance of the contents but because of fashion and comical words used by the politicians and totally out of context. 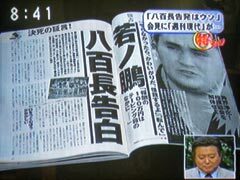 This tendency used to be supported by sensational weekly magazines such as Shuukan Post until the 1980s, while newspapers still kept a certain decency in their news reports. Since the end of the 1980s the distortion of news reports progressed further by the development of the so-called "wide show" of the commercial TV stations . 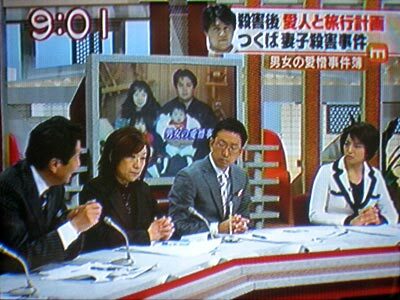 "Wide show" means news and talk show, and is a terminology invented and generally used at present in Japan. There are now about 3 dozen wide show programs broadcast from early morning till late at night. 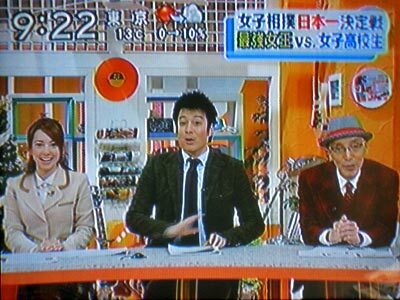 The first wide show was introduced by NHK in the mid-1960s using "The Today Show" as its model. In the early period the handling of news in wide shows was still rather modest. 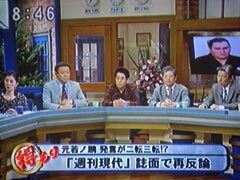 But, Hiroshi KUME, the newscaster of News Station (TV Asahi) changed the character of the wide show drastically by his clear-cut but emotionally biased comments at the end of the 1980s. His comments won overwhelming supports from the News Station's viewers. Thereafter, more and more newscasters tended to take up news sensationally and wrap up the report by their very personal and appealing but in most cases unfounded opinion. Newscasters were at an earlier time the journalists who had rich experiences in the news department of the TV station concerned. But, gradually such background has become irrelevant and famous celebrities also work as anchor persons. Reporters who are sent to the scenes use exaggerated and foolish expressions and allow their talk to ramble. Even the weather forecast also becomes entertainment and instead of a reserved middle-aged announcer a good looking young female "meteorologist" stands in front of weather maps. TV personalities and celebrities from entertainment and sports world are the majority among so-called commentators. I wonder why a comic artist, famous for his nonsense gags, can give meaningful comments on Japan's participation in the Operation Maritime Freedom or on the reform of pension fund? It is obvious that they cannot say anything meaningful and what they say only relates to trivial things such as politicians' special habits and fashions so that they can provoke laughter. It is usual that even serious news reports by high-qualified media do not fully reflect the truth. If you are insiders to certain news report, you must know this painful fact. In the case of news shows, you must be aware that they are from the outset not willing to make objective news reports but make sensational and appealing entertainments related to the topics. Therefore, objectivity is not guaranteed at all. To be precise, they are NOT news reports but merely entertainments. 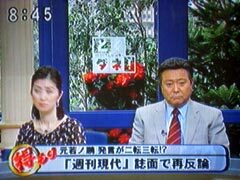 Therefore, the news programs of wide shows are in general not only a waste of time but also have adverse effects on Japanese politics, in a way that trivializes every political and economic issue and breeds the feeling of contempt, anger and indifference about politics, politicians and bureaucrats among the general public. 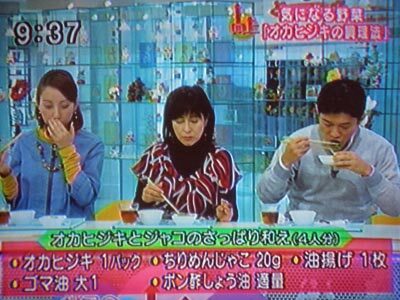 However, wide show programs, in particular certain newscasters such as Monta MINO, are extremely popular among housewives and it is believed that these programs reflect the feelings of ordinary people and the "eyes of housewives". And now, the feeling of ordinary people is the "royal decree" in the political world and decisive in political decisions of major parties. They see there the barometer of political climate for their parties. The bagatellization of the news shows is caused by the business considerations of TV stations. They are extremely keen about program rating and wide shows must continuously pay attention to this. Viewers of TV programs, in particular wide shows, are mostly house wives and they only want entertainment. Therefore, not only have news reports become entertainment, but also news items are often created or faked so that they might have good entertainment value. Certain serious cases have led the responsible TV stations to self-restraint, but it does not last long. The present situation awakes suspicion about the impotence of democratic decision making in Japan. Wide shows are at least partly responsible for this suspicion. If self-control of TV stations cannot function, such kind of news shows should be banned from commercial TV programs, I think. But, this is my private dream, which, I am sure, will never be realized.